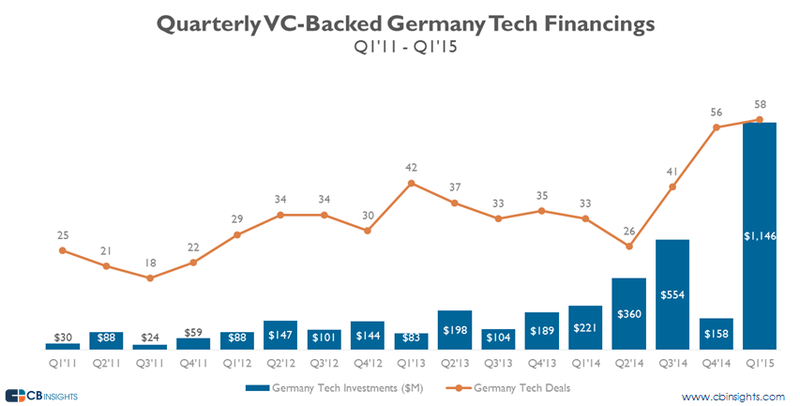 VC-Backed German Tech companies raised over $1.1B in Q1’15 as both deals and total funding reached multi-year highs. Germany’s Tech scene is on fire. After total funding to German Tech companies doubled in 2014 to $1.28B, VC-backed Tech companies raised a whopping $1.15B in Q1’15 across 58 deals. The feverish pace is the first quarter since 2011 to break the $1B barrier. Overall, deals and dollars were up 76% and 419% respectively versus the same quarter a year prior. Rocket Internet dominates top deals. The funding explosion was led by food delivery unicorn Delivery Hero, which raised $563M from Rocket Internet at a $1.88B valuation. The top 10 largest deals in Germany in Q1’15 were all to eCommerce companies, while 4 of the 5 largest deals went to companies backed by Rocket Internet, with WindeIn.de, an online retailer for baby and children products, being the lone company not backed by the German titan. Berlin continued to dominate the German Tech scene, with over half of all deals (and 4 of the 5 largest) were all to companies based in the capital. Munich was second with Rocket Internet-backed Westwing Home & Living raising a $29.7M Series C at a $532M valuation. Early-stage investor High-Tech Gruenderfonds was the most active VC in German Tech companies in Q1’15. The top 3 was rounded out by IBB Beteiligungsgesellschaft and German Startups Group as all three investors focused largely on the seed stage. Digitale Transformation: Warum wir den technologischen Wandel unterschätzen!